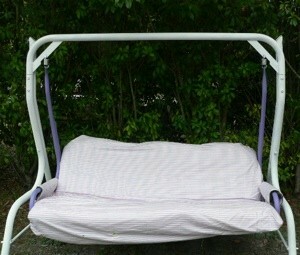 This is a yard swing I received from my local Freecycle. It was a rusty green with a torn seat. I covered it with purple and white striped fabric lined with a sheet of plastic left from another Freecycle deal. I painted it with white paint I had left over from another project. The purple paint came from a free Gliddon paint sample. Total cost: free, just time. "Free" is always best. You did a good job and I'm sure you are very pleased with it too. I want one too! What a pleasure it would be to swing in it on a cool evening with friends and dogs.